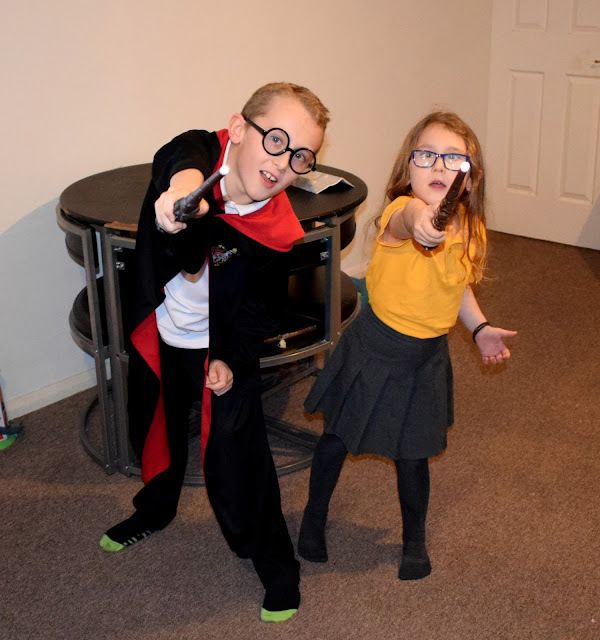 An exciting email recently landed in my inbox a few weeks ago, asking if James would love to try out the new Harry Potter Wizard training wands from Jakks Pacific and I barely had a chance to finish asking him before he starting jumping up and down excitedly shouting "yes please". The review of these magical wands is to coincide with the release of the new Fantastic Beasts - Crimes of Grindlewald movie which is released on Friday 16th November. James is a huge Harry Potter fan and despite only being 9 is rather rapidly working through all of the Harry Potter books he can get his hands on. So you can imagine how excited he was to get his hands on one of these Wizard training wands. We actually received two wands (much to the excitement of Evelyn who was desperate to have a wand of her own too!). 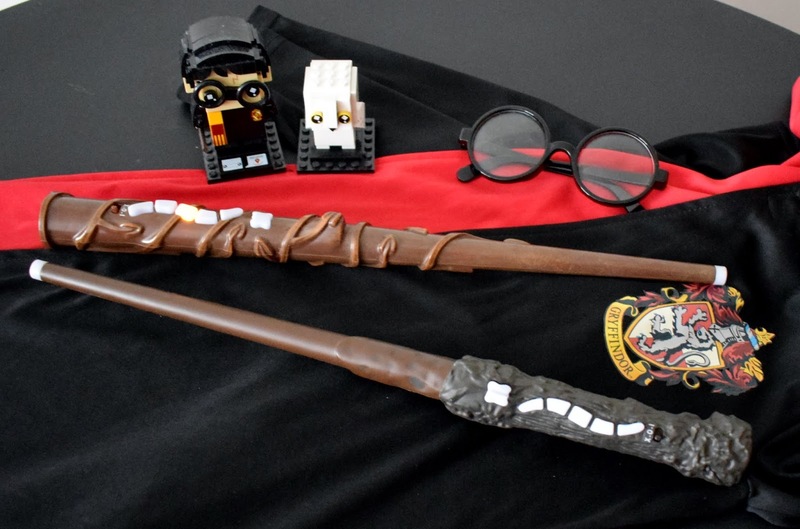 We had a Harry Potter wand and a Hermione Granger wand (you can also purchase the Albus Dumbledore and Lord Voldemort wands too). Each wand has five different and exciting features and can either be used on their own or used together to play against one another and even duel! This is a single player mode which gives you the chance to learn all 11 of the spells available within the wand. To activate this mode simply press the first button on the wand which will begin "spell training mode". This will begin a sequence of lights to glow on your wand which will correlate with a spell in the spell chart within the instruction booklet. If you get the spell correct you will here a unique noise from the wand, if its incorrect the wand will make a "fizzing" noise indicating the spell has been cast wrongly. If you are stuck on a spell and want to skip it you can just press the first button again which will move you onto the next spell. The spell practice mode is for two players and therefore you will need two wands to use this mode. To begin you will need to face your opponent with your wand in your hand, the first person needs to press the spell practice button (second button down) followed by the second person pressing their spell practice button. A matching spell will show (as a light sequence) on each wizards wand, both wizards then need to hold down the casting button and cast the spell as quick as they can. The winner is the wizard who casts their spell the fastest! This one took a bit of practice to get the hang of. This mode is slightly easier than the spell practice mode above and is again for two players (and two wands are required). At the bottom of the wizard training guide you will find five spells, these are the spells you will need for this mode. Wizards then cast one of the five spells at the same time, each time you complete a spell correctly a light will light up on your wand. The winner is the first person to get five lights on their wand, however if you both cast the same spell at the same time nobody wins a point. The Wizard tag mode is the mode that James and Evelyn has the most fun with. 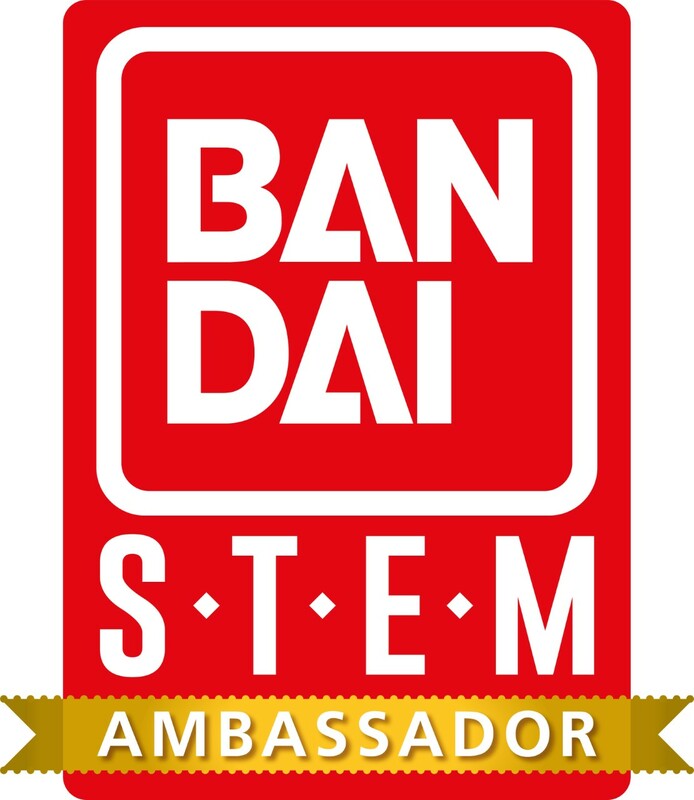 This mode is for two or more players and therefore if the perfect mode for a group of friends to play together. For this mode each person needs to press the wizard tag mode button on their wands (Button four on the wand) which will activate all five lights to light up on your wand, the aim of the game is to keep all of your lights lit up! Each player presses the cast button which will fire a tag spell from your wand, the aim of the game is to hit your opponents wand and knock out one of their lights. Each time you are hit or you hit an opponent, they will lose a light. The kids had so much fun running around the house, hiding from each other and then jumping out with a wave of their wand trying to knock out the others wand lights. The final mode on the wands is the free play mode which is exactly that... free play. This mode allows you to practice your spells, cast whatever spells you like and get in some practice for the modes above. This mode was perfect for Evelyn who is younger than the recommended age for these wands but still wanted to have a go like her big brother. There are a few little things I would change about the wands, one being the instructions, they are written in several language with each step being written separately in all languages it can take quite a while to try to read through them and get the hang of each step with an excited child bursting to get going. It would also have been nice to see the spells in a little booklet rather than on the paper instructions as I imagine these will get torn and tatty quite quickly. However none of those things bothered either of the kids and they have had (and continue to have) so much fun with the wands. 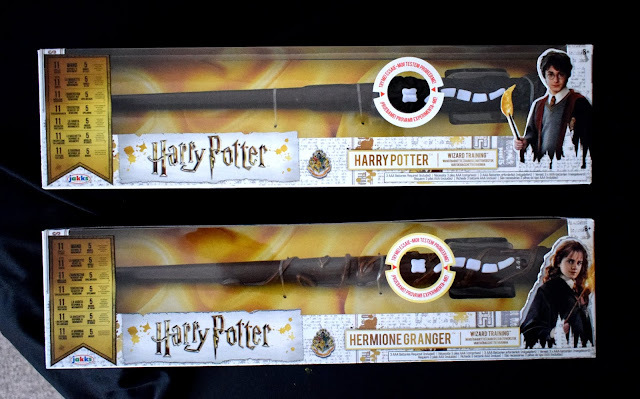 They are a great gift for any Harry Potter fan and with several modes to explore the wands will get lots of use. Even once you learn all of the spells, you can practice to get quicker and beat your friends during the duels too! When they aren't casting spells or duelling the wands are also great for role play and imaginative play too. Over all we give the Wizard Training Wands from Jakks Pacific a great big thumbs up. James is already asking if we can collect the other two wands and can't wait to learn all the spells and duel against his friends from school. 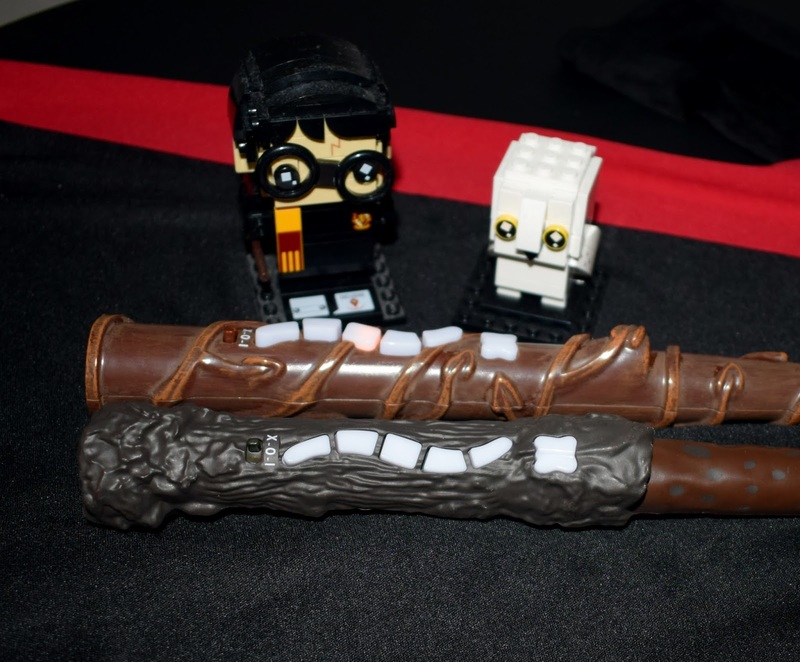 The wands are priced at around £25.00 each and aimed at children aged 8+. Are you or your children Harry Potter fans? Will you be going to see the new film? These look super fun for little or big Harry Potter fans! 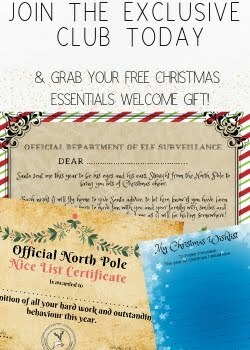 They look so goof for kids - brilliant Christmas gifts! We have these too, aren't they fab! Also, the wee Hedwig Brickheadz? I need him in my life! Too cute!